No TV show is more famous for portraying life in the White House better than the massively popular show, The West Wing. It’s therefore no surprise that in today’s political climate, rumors of a West Wing reboot are reviving nostalgia among the pundit class for the era of politics it portrays. But do all Americans remember the West Wing with such fondness? Or is the show’s popularity stratified along political lines, revealing hidden ideological roots in its appeal? To get a sense of where West Wing’s popularity comes from and how it fits into today’s political arena, Civis Analytics, a data science firm founded by alumni of the Obama campaign, conducted a nationally representative survey of 2,402 Americans, and asked them whether or not they liked the show. Do you have a favorable or unfavorable opinion of the television show, The West Wing? First of all, the results show that West Wing is indeed popular across the board. Another way to calculate popularity is to look at the % of respondents who have a favorable opinion out of those who know the TV show to begin with. Either way, the results tell a similar story. Digging a little further in the data reveals some differences in West Wing’s popularity, particularly when looking at age, education and income. In general, West Wing draws its biggest fans from older, more educated and wealthier Americans, particularly from the Northeast where most of the presidential drama unfolds. As illustrated in the graph below, the most dramatic differences are between Americans with the highest and lowest incomes: Americans earning more than $150,000 a year have a net favorability rating more than three times higher that of Americans earning less than $25,000 a year (48% vs. 14% respectively). But the most interesting differences in West Wing’s popularity point to the heart of the political nature of the show itself: party identity, political ideology and voting behavior. 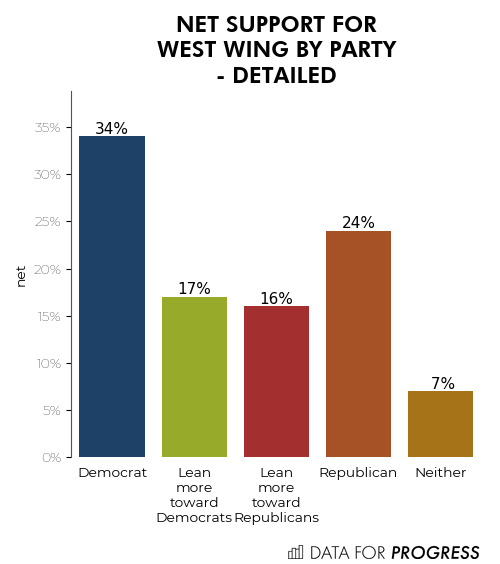 Overall, Democrats have a slightly more positive view of West Wing than Republicans (30% vs. 22%, respectively, though both groups still have an overwhelming positive opinion). But what seems to matter most, however, is how much people align with these parties. Americans who are decidedly Republican or decidedly Democrat are much more likely have a more positive opinion of West Wing than those who are a little less decided, and much more than the 15% of voters don’t subscribe to either party at all. This relationship between West Wing popularity and political party affiliation also extends deeper into political ideology, namely how conservative or liberal people are. For both parties, but particularly for Republicans, people who identify on the farthest ends of the political spectrum (i.e. very liberal Democrats and very conservative Republicans) like the show more than their moderate counterparts. In other words, Democrats who identify as very strong liberals like the show more than Democrats who identify as moderate, and Republicans who identify as very strong conservatives like the show much more than Republicans who identify as moderate. Lastly, and most importantly for the upcoming presidential elections, is what West Wing’s popularity reveals about voting behavior. Similarly to the divide between Democrats and Republicans, people who voted Clinton have a more positive opinion than those who voted for Trump (36% rating vs. 26%). But the starkest contrast in opinion is between those who voted and those who didn’t vote at all. 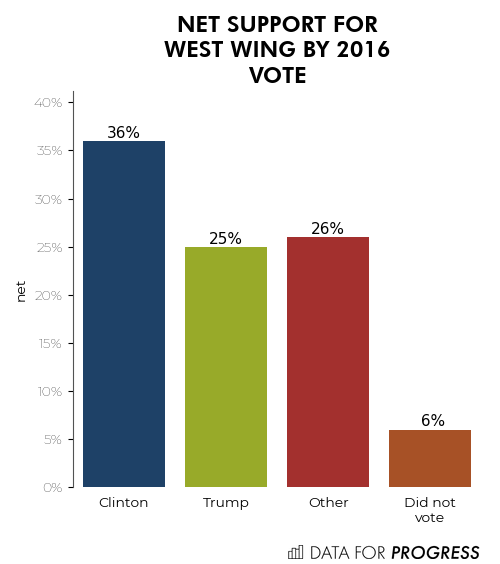 For the 40% of eligible voters who did not vote in 2016, West Wing isn’t so popular. Non-voters have a net favorability rating of 6%, meaning that almost as many people have a negative opinion as a positive opinion. The results of our survey show that a potential West Wing reboot might receive a warm welcome across America, particularly from the older and more affluent generation. And while it also shows that West Wing stands out as one of the rare topics that liberal and conservative America can agree on, it might not be the rallying cry to motivate non-voters to come out and vote in the 2020 elections. Fred DeVeaux (@DeVeauxFred) is Senior Researcher of public opinion at Dalia Research.